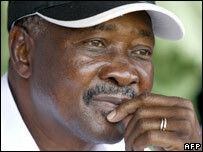 Mali's President Amadou Toumani Toure has won a second five-year term in first-round presidential elections. Provisional results from Sunday's election showed Mr Toure received 68% of the votes, while Ibrahim Boubacar Keita finished second with 19%. Mr Toure far exceeded the 51% he needed to avoid a run-off election, interior ministry official Boubacar Sow said. International monitors said the vote appeared to have gone smoothly, but opposition candidates alleged fraud. They said voters' lists favoured Mr Toure and accused his supporters of using state assets for his campaign. Voter turnout for the poll was 36%. Mr Toure, known as "ATT", played a leading role in ending Mali's military dictatorship with a coup 16 years ago. He then organised elections in 1992 and handed power over to the winner, Alpha Oumar Konare. Mr Toure was elected president in 2002, after Mr Konare had served two terms. Mr Keita is the president of Mali's National Assembly and a former prime minister who came third in the 2002 presidential poll.